A few months ago, I had a guest post on my site about trading the forex market, and I had a comment requesting how I should talk about the dangers of forex investing. So because I am responsive (albeit slowly responsive, sorry! ), here's my post on the Dangers of Forex Investing. Bear with me here, as I don't know very much about forex investing as I personally haven't included this type of investing in my Questrade portfolio. Well, I guess except for some USD/CAD that I buy when the CAD dollar is up. But it's more for my personal spending when I go to the United States. 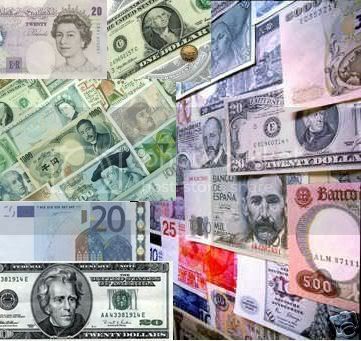 Forex stands for Foreign Currency Exchange. Basically it's the trading of the world currencies. You buy a world currency, hold it for a period of time, and expect/ hope that it will rise in value. When (or if) that happens, you sell it. It sounds quite similar to buying and selling equities. Except that it can be much more risky than trading with the conventional stock market. Here are some qualities of the Forex market that makes it dangerous. There's lots of forex day trading brokerages popping up these days, especially with it being so easy to do online. Just be careful and make sure you don't go head over heels and find yourself in investing debt =( If you are still interested in trading on the Forex Market, you should try a Forex Market simulator first (use fake money). Also, I hear that they have Forex Robots that use algorithms to make the currency trades automatically, which might help take the panicky psychology behind currency trades, and help limit your losses. Don't be lured into “MAKE BIG MONEY FAST” gimmicks from the Forex Market. Readers, have you invested or traded with the Forex Market? What are you thoughts on it? Zero-sum markets are definitely a bad deal. The only people that make money in Forex are the banks that convert your money for you while charging you 1% commission. I do have exposure to other currencies though through non-currency hedging index funds. Another note on Forex, the currency market cycle is so long so you could be in the negatives for a long time. You need to be glued to your screen in order to spot opportunities and identify exit/entry points. This is no buy and hold type of investing unless you have nerves and deep pockets to trade off longer time frames. A lot of the brokers out there are market makers who will take the other side of your trade. I prefer stocks anytime over FX. @Mark- Thanks for visiting. You’re so right about the only people making money in the Forex market being the banks doing the commissions. @Beating The Index- Interesting you both have different view points on whether forex is buy and hold or quick trading. I haven’t touched FX myself at all, and don’t intend to. Stocks all the way baby! This definitely sounds risky. It seems like you’d have to be really on top of world news and be terrific at predicting economies and their dollar worth. I don’t see myself doing this kind of investing anytime soon. @Little House- Yeah, and who really can be on top of the world news? No one knows when things will happen (unless you are a spy, of course lol). I don’t think I will do this kind of investing either, it’s too risky. @Invest it Wisely- LOL! You had me fooled for a minute there, my eyes were widened like saucers. The scariest one here is the fact that it’s open 24 hours, especially in this recent market where there are market crashes left and right. I don’t want to go to sleep worrying that when i wake up, the currency I invested in went down the drain. @Andrew @Money Crashers- I know eh? You really don’t know what will happen from day to day. Things are going on politically around the world every nanosecond. Scary stuff. Forex can be a great opportunity or a desaster experience. you really have to follow formation and be conscient that trading is not a game and can have risk. There is a lot of money to be made on Forex. It needs understanding and lots of practice. You must get a ‘feeling’ for the market. It is true that 95% of people lose on forex but that is because they don’t understand, leverage. risk, money management etc and don’t have a strategy worked out. There are a lot of technical indicators and ‘laws’ to be studied. It’s not just for climbing in and getting rich! Anything that is worthwhile takes lots of time. You don’t become a specialist instantly! People blame forex for losing their money, in the meantime they have only themselves to blame. Money management boils down to risking 2-4% of your capital per trade. If you do that you need to lose 30 times in a row to blow all your money. Using a proper strategy that is just about impossible! Thanks for this article is very good article. I have a great advantage. I think that would be useful to many people. Let’s put it this way again. Personally, I’m glad to get to know these stories. Wishing the author has lucky and happy. This is a good, common sense article. Very helpful to one who is just finding the resouces about this part. It will certainly help educate me.. I am really enjoying the theme/design of your site. Do you ever run into any web browser compatibility issues? A handful of my blog readers have complained about my site not working correctly in Explorer but looks great in Chrome. Do you have any advice to help fix this problem? This logic is the financial analogy of doubling up your bets at craps – each time you lose you bet double on the next bet. Funny how much the casinos just love people who play this strategy.